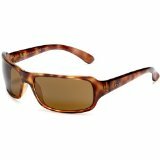 Stylish Wrap Around Style Designer Sunglasses for Women by Ray Ban, Smith Optics, Tory Burch, Bolle Anaconda, Coach and more. These wrap sunglasses have a fresh style with familiar fit and features. Lightweight performance with street-wise swagger. Smith integrates authentic style with uncompromising performance in the highest quality sunglasses available. at Smith...We Make the Great Days Better. Costa polarized sunglasses include the high definition 580 lenses, which are unparalleled in their ability to cut glare and enhance your view of the outdoors. Premium grade plastic resin lens which are 20 times more impact resistand than glass and a third of the weight. Polished wrap-around rimless sunglasses with a chic gradient lens for total UV protection. Tory Burch logo stamped at each temple. Cleaning cloth with carrying case complete these sleek shades. These Versace wrap sunglasses for women are a real attention getter. Luxe, designer style wraps around your face, providing full UV protection to your eyes. 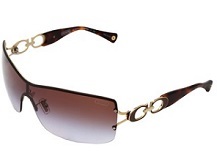 Cleaning clothe and case included with these stylish Coach wrap around sunglasses. The Highstreet 4075 is a smooth frame that offers excellent protection and are so comfortable you may find yourself wearing them on a non-sunny day. Shatterproof Polycarbonate Lenses Wrap and Protect Eyes from debis and sunlight. Polarized protection eliminates glare from reflective surfaces. Fashionable design with almost-invisible bifocal line. Wraparound glasses are shaped to keep light from shining around the frames and into your eyes. Studies have shown that enough UV rays enter around ordinary eyeglass frames to reduce the benefits of protective lenses. Large-framed wrap around sunglasses can protect your eyes from all angles.